Firecracker Sticks Queso Cheese Rolled in Tortilla Crumbs, Just the Right Amount of Burn! Lightly Smoked Chicken Wings Fresh wings smoked & served naked. Try them dusted with cherry or Cajun rub or one of our sauces. If you're planning a party or get together order some BBQ Pork or Turkey by the pound. Don't forget the coleslaw. Call Six for details. Hot Smoked Ham and Swiss Our own smoked ham piled hign on sourdough bun with melted swiss. Two hands needed for this sandwich. Our own Homemade Thin Crust Pizza, with your choice of toppings. 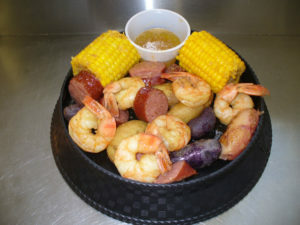 Famous Sunday Shrimp Boil Coming Soon. COPYRIGHT (C) 2016 LAZYACESALOON.COM. ALL RIGHTS RESERVED.